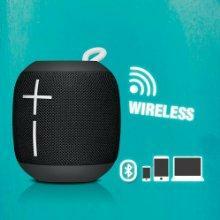 Meet the UE Wonderboom. Don’t let the small package fool you. It packs surprisingly serious sound. Each portable speaker is capable of outputting a big, clear, crisp 86 decibels of 360-degree sound so it’s loud enough to liven up any party or to just chill out. Enjoying your music around water? 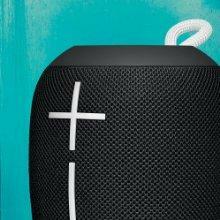 No problem – the UE Wonderboom has been IPX7 rated, to withstand depths of 1 meter for up to 30 minutes. Enjoy it in the rain, around the shower or in the tub. 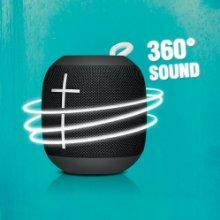 Each UE Wonderboom is powered by Bluetooth allowing you to connect up to 100ft (30m) away without your music dropping out. Seamlessly control your music from across the room. Tired of short battery life? The UE Wonderboom lasts for up to 10 hours on a single charge, so you can listen for longer. Run out of charge? Plug it in and 2.8 hours later you’re ready to go again. It’s easy to get started with your UE Wonderboom. Just hold the UE logo once to play and press it again to pause a song. Want to skip a song? Just double tap it and you’re good to go. Make the most of your UE Wonderboom by wirelessly pairing two UE Wonderbooms together. Connect up to two UE Wonderbooms to the same source at the same time. 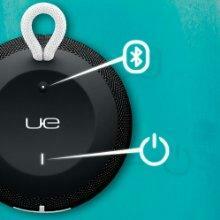 Hold the UE button at the top of your UE Wonderboom and pair up with others to party louder. Hear your music like never before with UE Wonderboom. 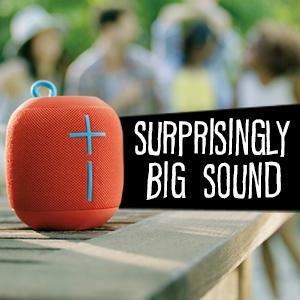 It’s a super-portable Bluetooth speaker with surprisingly big sound. Sound that’s clear, crisp and full of big, beautiful bass.